Forest Dark interweaves the stories of two disparate individuals—an older lawyer and a young novelist—whose transcendental searches lead them to the same Israeli desert. After the death of his parents, the end of his marriage, and retirement from his law firm, Jules Epstein begins shedding his considerable possessions. Searching for some indefinable meaning, he travels to Israel, the land of his birth, with vague plans to establish a memorial to his parents. When a charismatic American rabbi ropes him into a reunion of the descendants of King David, Epstein finds himself in the desert where a film about the biblical king is being shot. Meanwhile, a well-known American writer in a failing marriage of her own has arrived in Israel with the hope of jarring herself from writer’s block. When she meets a literature professor who proposes a project she can’t turn down, she’s drawn into a mystery that alters her life in ways she could never have imagined and also unexpectedly finds herself in the desert. Delving into issues of identity, purpose, the rejection of convention, and the possibility of looking beyond ourselves toward the infinite, Forest Dark is a profound exploration of how we control our own narrative and how that narrative can control us. 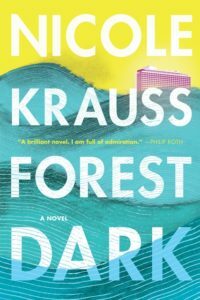 Krauss is the author of Great House, a finalist for the National Book Award; the New York Times bestseller The History of Love; and Man Walks into a Room. She was selected as one of Granta‘s Best Young American Novelists in 2007 and named to The New Yorker’s “Twenty Under Forty” list in 2010. In conversation with Sarah Wildman, who writes about global identities and borders for Vox and is the author of Paper Love: Searching for the Girl My Grandfather Left Behind. Book signing to follow.